Splash Pad Parks | SplashPadParks.com is your guide to the best free FUN! 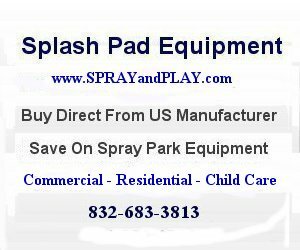 at Splash Pads, Spray Parks, Spraygrounds, and Water Parks in the USA. Take the Kids to a Splash Pad Near You! SplashPadParks.com. Your guide to the best free FUN in the USA! This is a database of Splash Pad locations all over the United States. Most splash pads on this siteÂ can be used forÂ free or a small fee. Splash pads are also called spray parks, zero depth pools, water spraygrounds, water parks and many other names. A splash pad is a recreation area, often in a public park, for water play that has little or no standing water. This is said to eliminate the need for lifeguards or other supervision, as there is little risk of drowning. Most splash pad are outdoors but indoor splash pad are becoming popular. Splash pads come in many sizes and shapes. I have seen splash pads with Free Admission as small as 20′ X 20′ and as large as 125′ X 225′. This is a new website and in the next few months we plan to add hundreds of Splash Pads with their address and map location. Thanks to all the people that have already send us information on Splash pads they wanted listed. If you want to help us build our database of Splash Pads listings, suggest changes to a listing or add a better description to a current listings, please use the form below.Â We usually have splash pads suggested by our reader posted within 24 hours. Use form to suggest a new splash pad to add to the site, suggest changes to a listing or add a better description to a current listings.